New lower prices for 2019! Our CO2 guns are available to purchase for collection in store only - Once you place your order, you will receive an order confirmation - you also need to await a secondary email confirming availability. ID will be required upon collection. 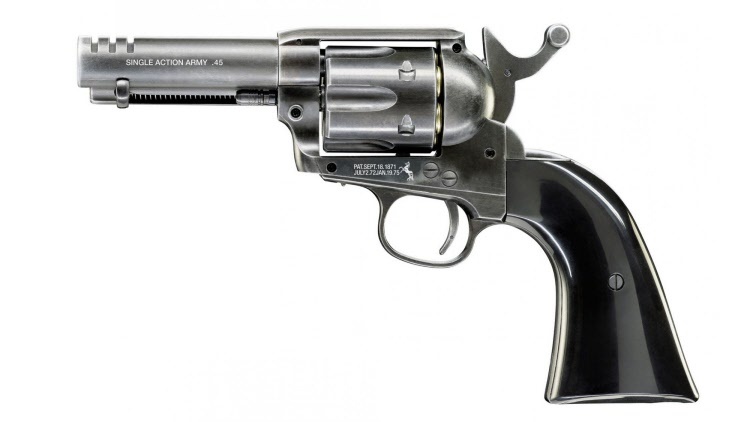 This replica of the famed “Peacemaker” became a worldwide favorite in a short time – and not just among Western fans. 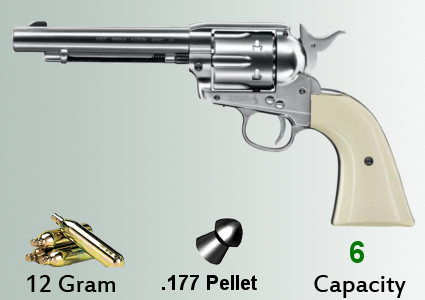 The Colt Single Action Army Revolver, as it’s officially called, is powered by a CO2 cartridge and has six loading shells for realistic firing of 4.5-mm pellets. 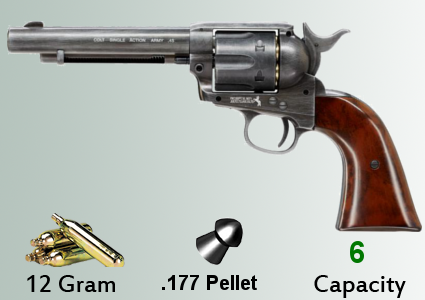 The long, rifled 7.5-inch barrel ensures unprecedented precision and has a muzzle energy of 3.5 joules. 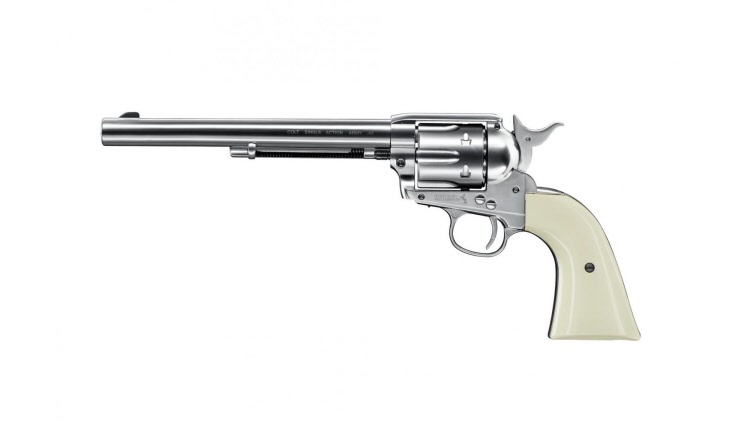 Nickel plated with ivory style grips. This replica of the famed “Peacemaker” became a worldwide favorite in a short time – and not just among Western fans. 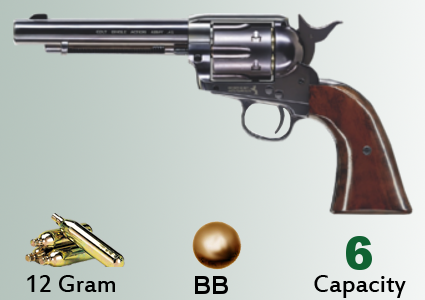 The Colt Single Action Army Revolver, as it’s officially called, is powered by a CO2 cartridge and has six loading shells for realistic firing of steel BBs. 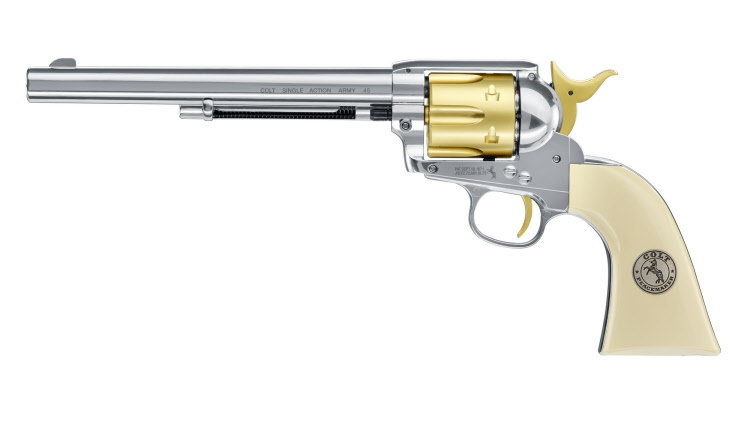 The long 7.5-inch barrel ensures unprecedented precision and has a muzzle energy of 3 joules. This classic blued version comes with brown plastic grip plates. 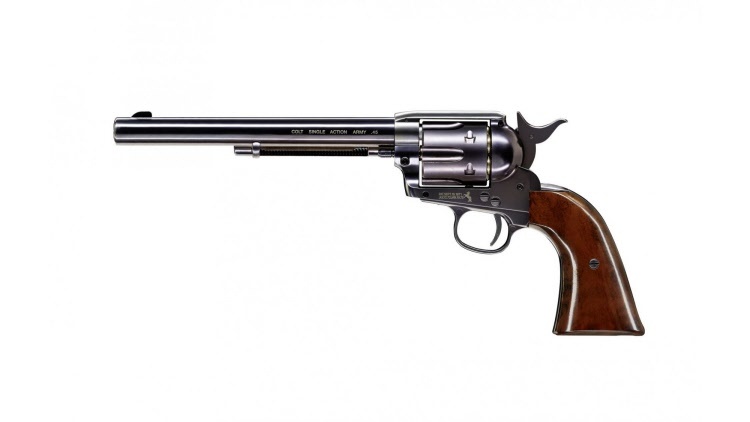 This replica of the famed “Peacemaker” became a worldwide favorite in a short time – and not just among Western fans. 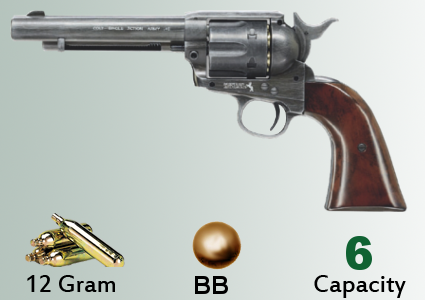 The Colt Single Action Army Revolver, as it’s officially called, is powered by a CO2 cartridge and has six loading shells for realistic firing of steel BBs. 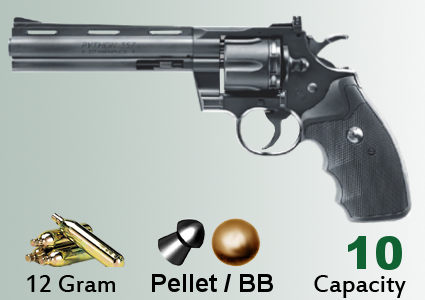 The long 7.5-inch barrel ensures unprecedented precision and has a muzzle energy of 3 joules. 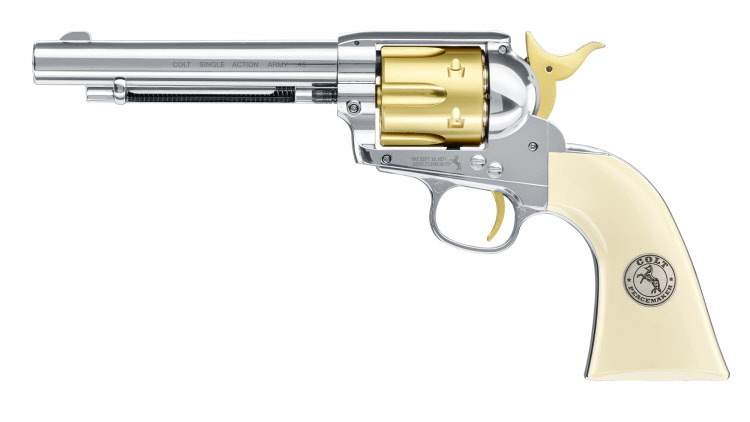 This nickel-plated version features white plastic grip plates. 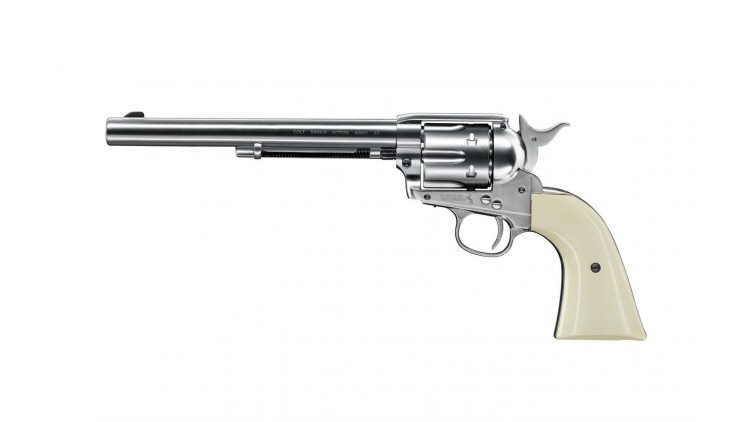 This version of the famed Colt Peacemaker is perfect for specialists and quick-draw experts. 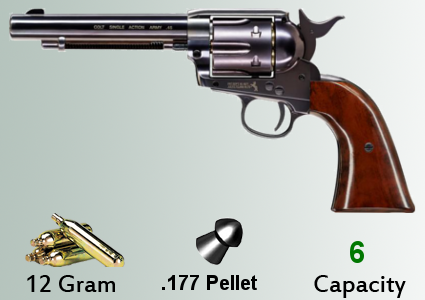 It has a short 3.5-inch barrel and comes without a sight, which would only get in the way at short distances. The specially shaped hammer can even be “fanned” with your second hand. 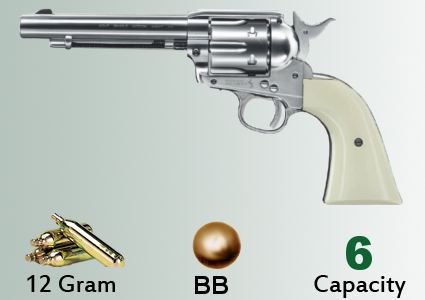 In terms of mechanism and function it is otherwise the same as the other Colt SAA revolvers, with a CO2 cylinder concealed in the grip and six nickel-plated loading shells, each of which takes a 4.5 mm steel BB. 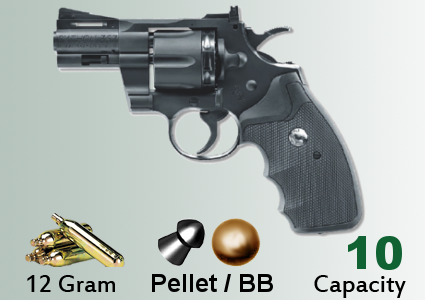 Pack of six shells to fit Umarex Colt SAA Peacemaker CO2 pistols.